Every once in a while, our planet captures a “mini-moon,” a tiny asteroid that hangs out in our orbit for a bit before venturing back into the depths of space. New research suggests these small, temporary natural satellites carry tremendous scientific and commercial opportunities — but the trick will be in finding them. Twelve years ago, astronomers with the Catalina Sky Survey detected our planet’s first and only known natural satellite other than the Moon. 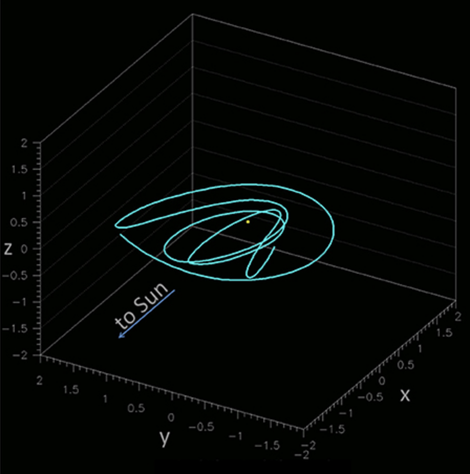 Named 2006 RH120, it measures about 6 to 10 feet in length (2-3 metres), and it temporarily enters Earth’s orbit every 20 years or so, before returning to its ordinary orbit around the Sun. Surprisingly, and despite steady improvements to telescope technology, it remains the only known mini-moon, or TCO (temporarily captured orbiter). This is a shame, according to new research published in Frontiers in Astronomy and Space Science, as mini-moons could help us to better understand asteroids and asteroid formation, the dynamics of the Earth-Moon system, and other celestial phenomena. That said, the authors of the new study, led by Robert Jedicke from the Institute for Astronomy at the University of Hawai’i-Mānoa, say we’re about to get a tool fit for the task of detecting TCOs, namely the Large Synoptic Survey Telescope (LSST) currently under construction in northern Chile. Indeed, these transient, fast-moving objects are difficult to detect, though they’re likely to exist in great abundance (though that’s an assumption that still needs to be proven). Measuring anywhere from 3 to 10 feet (1-3 meters) in diameter, mini-moons make one or several orbits of Earth before breaking free. Sometimes they perform a brief fly-by, swinging past Earth and assuming a new orbital trajectory around the Sun without making a complete orbit of our planet. As the authors of the new study point out, we have much to learn about these mysterious objects. What’s more, meteorites that crash to Earth provide only an indirect way of studying asteroids, as Earth’s atmosphere destroys weaker materials contained within the objects. Mini-moons, the authors say, are “perfect targets” for space missions, since they could be brought back to Earth in significant quantities for analysis and shielded from the effects of atmospheric entry. (1) the development and testing of planetary defense technologies (e.g., deflecting an asteroid); (2) validating and improving close-proximity guidance, navigation, and control algorithms, (3) testing close-proximity procedures and protocols for safe operation of crewed missions around asteroids, and (4) establishing the feasibility of asteroid mining technologies for future commercial applications, all in an environment where the round-trip light-time delay is a few seconds. This short list illustrates that minimoons have far-reaching non-science implications for different stakeholders. As noted, the LSST will be the ideal tool to detect these mini-moons, and it’s expected to get up and running in about five years. Once complete, this telescope will be equipped with a gigantic mirror to collect light from dim objects, and a camera with a generous field of view, which will scan the entire sky more than once a week. Astronomers working with the LSST should be able to detect and confirm the existence of mini-moons and track their orbital paths around Earth. Once detected, scientists can then plan out potential missions.